You can help bring a new online SF/F magazine to life. Hugo Award-winner Lynne M Thomas and Hugo Award nominee Michael Damien Thomas are launching Year One of Uncanny Magazine, featuring professional online SF/F: fiction, poetry, essays, and much more. To make this a reality, they’ve created a Kickstarter campaign to reach a goal of $26,000. As of this writing, they have already received over 50% – $13,000 – in just the first 24 hours. Join in and support a new outlet for great online SF/F! Update 8/15: The Uncanny Magazine Kickstarter reached 100% funding last night, but there are still some awesome stretch goals (extra essays, extra stories, and more) to reach before the deadline of August 28! This entry was posted in Science Fiction, SFF and tagged fantasy, Lynne M. Thomas, Michael Damien Thomas, science fiction, sff on 30 July 2014 by cepheusradio. … Ancillary Justice, by Ann Leckie! Congratulations to Ann and to her fellow nominees. 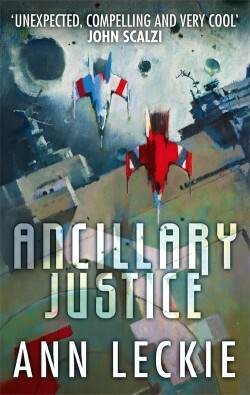 Orbit Books: ANCILLARY JUSTICE is the Arthur C. Clarke Award winner! This entry was posted in SFF, SFF awards and tagged Ancillary Justice, Ann Leckie, Arthur C. Clarke Award, science fiction, sff on 2 May 2014 by cepheusradio. This past Monday, I and several others attended a live hangout/panel discussion moderated by Mike R. Underwood of Angry Robot Books with four of their authors – Madeline Ashby, Wesley Chu, Cassandra Rose Clarke, and Ramez Naam. The theme was science fiction in the 21st century, and covered topics such as literature, the social implications of science fiction, the impact of instant communication in their work, and in-depth discussion of the implausibilities in the SF/romance film Her. This entry was posted in Science Fiction, SFF, SFF Events and tagged Angry Robot Books, Angry Robot Live, Cassandra Rose Clarke, Madeline Ashby, Ramez Naam, science fiction, sff, Wes Chu on 1 May 2014 by cepheusradio. Cartographer and science/SF enthusiast who writes about science, science fiction, and general life matters. He lives in southern Ontario, Canada with his wife and daughter.